Originally published as a guest post on Tekli.co. Some of the world’s most successful large companies, the likes of Apple, Johnson & Johnson, PepsiCo, Philips, and 3M, have a new common denominator. In addition to the more common executive-suite positions, each of these companies now has a CDO, or Chief Design Officer. The move to hire CDOs isn’t just something in the water, though. 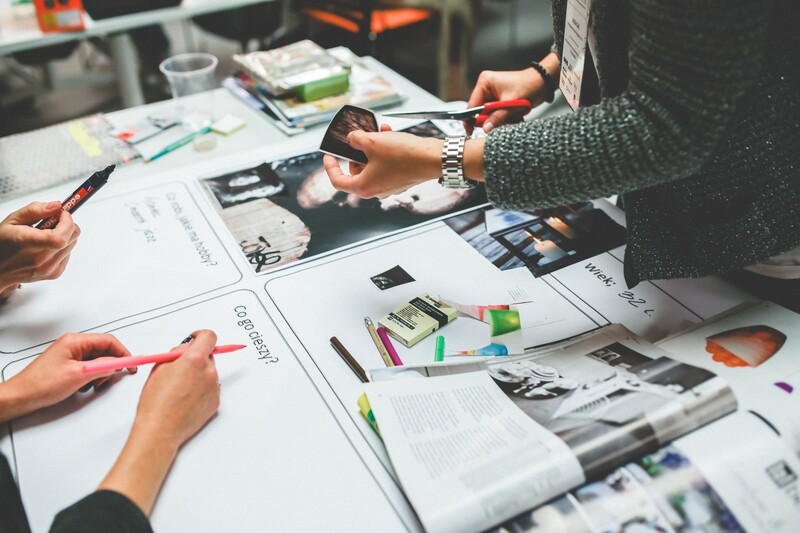 Each of these companies has caught on to design’s greater potential, and while all businesses may not need to move design to the executive level, there is without a doubt far more that design can do to improve business health than most people realize. Broadly speaking, many companies think of design as that extra element — the cherry-on-top of business acumen. The problem with this line of thought is that it confines design’s value to one of aesthetic, while, in reality, design includes a much wider and more impactful range of touchpoints. At its heart, design is logical; it’s about a process that creates an entity, product or experience that communicates an idea or a function and builds relationships between people, services or objects. And just like logic, it permeates every aspect of how a business functions. At Paradigm, we think of design’s impact as if it was an ecosystem. 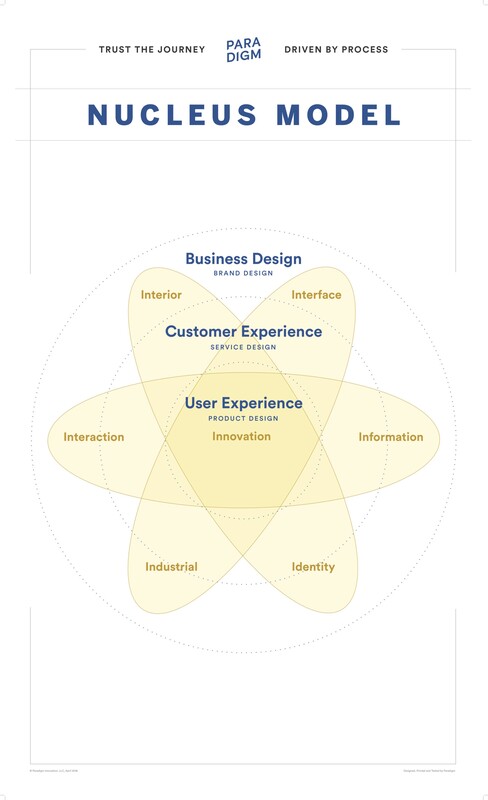 The ecosystem model requires a much broader look at business and an understanding of how design affects each aspect of a company, from its product line to the impression that its customers feel because of the colors it uses in its logo. Just as with an environmental ecosystem, no one element functions without another. In the design ecosystem, this means that a company which lacks a coherent brand strategy most likely has trouble creating a coherent strategy for their line of products or services. Translated even further into the business world, this means that a company which isn’t on the same page when it comes to how customers perceive its brand is mostly likely having trouble selling its products or gaining traction. A lack of unity when it comes to brand or product perception isn’t a death-sentence, rather, it’s a sign that it’s time to use design’s tools to rethink how a business functions and build a stronger platform on which it can grow. This is where design’s logical tools truly shine — design’s ubiquitous value is perhaps most evident in the design process. The design process is based on iteration. While a traditional business process may include one round of strategy, research and prototyping before moving to a final build or solution, the design process proposes multiple, cyclical rounds of strategy, research and prototyping before the final proposal. This model ultimately arrives at a more robust, more impactful solution because it allows greater input from alternate perspectives and potential users (or customers). In addition, the design process mitigates risk by allowing for more prototype improvements before final production, decreasing the probability that the final product will need to be re-worked or rebuilt after-the-fact. One great example: In early 2010, Kevin Systrom, in an effort to benefit from recently-emerged geolocation technology, created a prototype app called Burbn that was designed to allow users to check-in at specific locations, create plans, and post about their day. Rather than checking-in, though, most users just ended-up posting pictures of their food, their dogs or their day-to-day lives. A short time later, aided by Mike Krieger, the pair realized that the app’s greater potential existed in enabling users to create conversations by sharing photos online. The first version, called Scotch, was a bit complicated. User feedback suggested that it was taking far too long to capture and upload a photo. After several more rounds of feedback, they decided to redesign the app to make it as easy as possible to share photos and officially launched the fully-functioning version in October of the same year. The result was 25,000 users in the first day and 1 million users in three months — and the growth didn’t stop there. Their final app, what we know today as Instagram, sold to Facebook for $1 billion in April of 2012. Read more about Instagram’s story on Tech Crunch. Instagram is just one of many companies that realized the design process’ full potential and exploited it to the fullest. Their successful exit can be attributed to the multiple rounds of feedback and refined prototypes that came before their final product launch. Despite the numerous tech companies that have achieved success this way, the design process isn’t only for digital products or services. Companies that are capitalizing on the benefits of a robust design process have figured out how they can apply that process to their specific business areas. Scandinavian furniture giant IKEA used the design process to come up with their innovative flat-packaging shipping solution, maintaining high-quality pieces while keeping costs down for the consumer. Danish toy maker LEGO also went through the process with sustainability in mind and ultimately created a solution that swapped metal parts for plastic ones, boosting overall company sustainability by 10% and reducing final product cost. The real key to unlocking this benefit then, the very thing which CDOs are tasked to do, is understanding how the design process can best be used within their own companies. Clearly define your company or business’ value proposition. What is it that you deliver to customers that makes you unique or makes you stand out in your field? This might be a product you sell that no one else does, or it could be the high-standards you set for your customer experience. Make sure you and your team are on the same page. Identify your greatest challenges and organize them into categories. For example, “high turnover” and “employee burnout” could be grouped under “personnel” or “HR.” Use sticky notes and a single white board to turn this into a team-based activity. Keeping your value proposition in mind, have each team member focus on a specific issue category and spend some time ideating possible solutions to the problem. The goal in this stage is to produce as many ideas as possible — don’t worry if an idea seems ridiculous at first. You can always reign concepts in, it’s much harder to build them out. Once you or your team have spent time creating possible solutions for each of the categories, come together and discuss them. Encourage feedback and new ideas, and look for patterns that may emerge between different solutions. Don’t immediately strike an idea down for being too far-fetched, instead, talk about how it could be edited or altered to be more impactful. Without discarding any ideas (you never know when you might need them later), pick at least one from each issue category and separate them from the rest. Look for ways to combine ideas together or turn them into a “fully packaged solution” that you can present to your employees or executive board. Present your package of ideas to your peers or colleagues and open the floor for feedback. Have reviewers write their notes or commentary on sticky notes and pin them to the parts of your solution with which they correspond. Discuss them in a group and record possible issues or changes that will need to be made. With your newly acquired feedback, go back to step 3 and rework your ideas. Follow this recursive model until you have achieved consensus amongst your team. Try it out. Remember that some ideas will need to be tested at a higher-fidelity before more feedback can be acquired. You can always go back to stage 3 and further refine your ideas, systematically closing-in on the final solution. 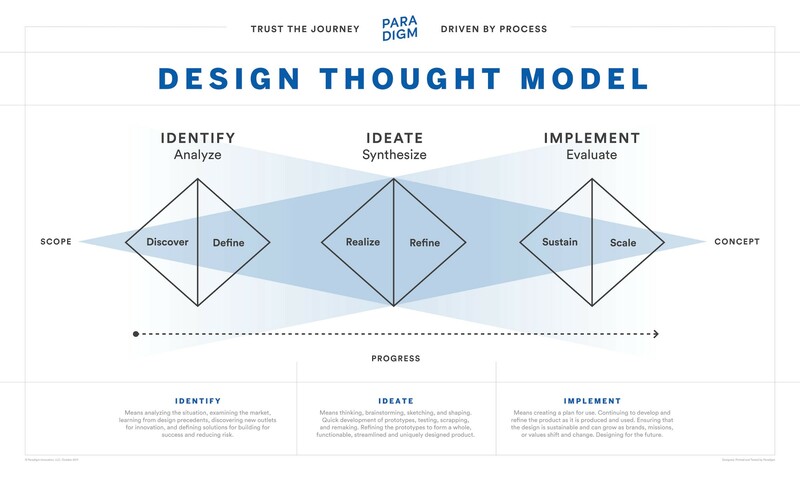 This design process model can be adapted for use by any individual or group in any industry. For even more idea-fuel, open this activity up to multiple groups within your team or company and work to bring everyone’s ideas together. If your business or company has figured-out how to use the design process to your greatest advantage, or you’ve identified a method that builds value for your company, please share this post. For more about Paradigm and how we help businesses realize the power of the design process, visit our site at ParadigmID.com. The Catalyst is a pioneering publication sparking creative conversation in innovative design, business and consumer technology. Thoughts and opinions of PARADIGM Innovation; we are a global design firm creating impactful design solutions through innovative business strategy. Get inside our headspace here, here, and here. Have an idea? Drop us a line.